Looking from the edge of the property towards the river, one can sometimes see anglers trying their luck there. 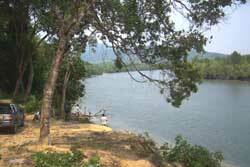 This photo is taken at the river bank towards Damai Laut / Swiss Garden International Resort. 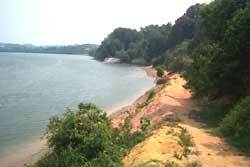 One can take a leisure walk along the bank to enjoy this beautiful scenery.